These Curry Row eateries may look identical to passersby—indeed, a conspiratorial theory among long-time East Village residents is that the restaurants share one kitchen —but the relationship between the establishments is anything but harmonious. In fact, there is no relationship to speak of—Milon and Panna II have been embroiled in a rivalry for over 20 years that has no end in sight. 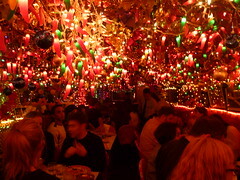 The central conflict between the two restaurants stems from a dispute over authenticity. Although neither family-owned business denies that Milon was established first (in 1982, preceding Panna II in 1988), the question of innovation has become the basis for a rivalry that has been passed down from one generation to the next. And now, with Mr. Khan venturing into cyberspace before his rival, the bar has been raised. The feud can be summed up with one simple question: who came up with the idea for the lights? Each side claims the origin story as its own. Thahmina Ahmed, the daughter of Milon founder Olid Ahmed, is running the restaurant while her father is away for several months. A 28-year-old nursing student at Long Island University, Ms. Ahmed is thoughtful and composed, ending each sentence with a slight smile. Customers were drawn in from the street, Ms. Ahmed says, and her father began to add other decorations, like the chili peppers. “It’s a nod to the fact that Indian people like spicy food,” she explains. Next door, Mr. Khan, who took over the business from his father Fazid in 2001 after earning his MBA from NYU, tells a different tale. According to Mr. Khan, during the winter of 1988, his father decided to hang strands of blinking Christmas lights, tinsel, and a few small plastic flowers to add holiday cheer. 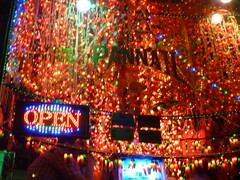 The lights weren’t taken down immediately after the holidays, and customers coming in February, Mr. Khan says, enjoyed the festive touch. 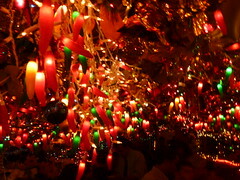 The chili pepper lights—identical to those hanging in Milon’s dining room—were inspired by some he saw in a Mexican restaurant in Midtown one night. “Next door copied our lights,” he states unequivocally. And their claim that they were the innovators? “A complete lie, 100 percent,” says Mr. Khan. To guard against imitation, his newest business investment, a revamped website, is spoke of in a whisper, accompanied by wary glances. In 1988, Mr. Khan was 15 years old. Thahmina was only six. But the animosity between their fathers is a birthright, inherited along with the ever-growing collection of twinkling lights. The Hatfield/McCoy-like rivalry has become a legacy that long-time customers of the restaurants ascribe to without reservation. Each establishment claims that the majority of its business comes from unflinchingly loyal customers. On an average weekend night, two lines curl out of the restaurants’ doors, down the stairs, and across the sidewalk: one for Milon, the other for Panna II. 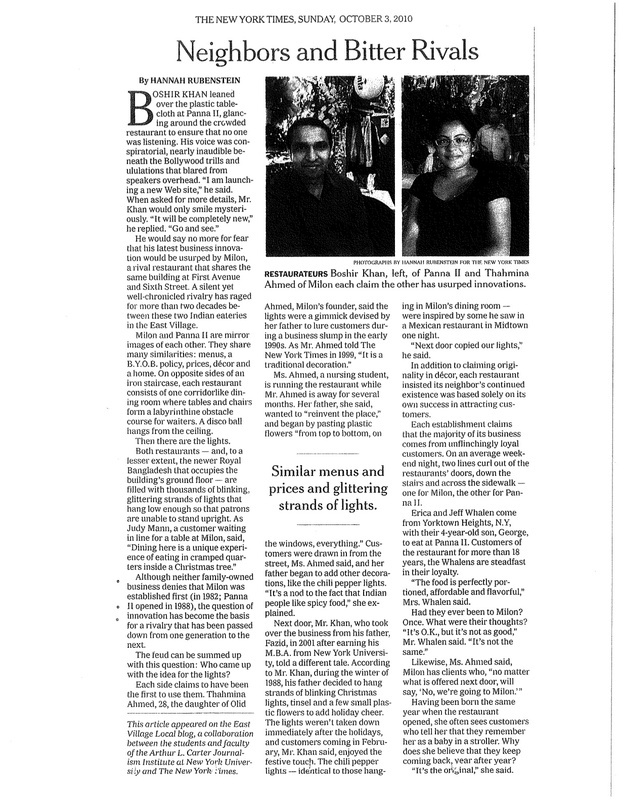 Likewise, Milon has clientele who “no matter what is offered next door, will say ‘no, we’re going to Milon,’” Ms. Ahmed says. Having been born the same year as the restaurant opened, she will often see customers who tell her that they remember her as a baby in a stroller. Why does she believe that they keep coming back, year after year? “It’s the original,” she says simply. Milon does not currently have a home on the internet. But Panna II does. The soon-to-be-relaunched site has moved the endless war into a new sphere, screaming its origin story in black letters against a red background. 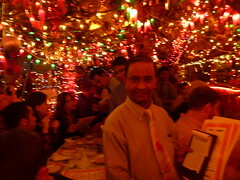 The site offers its own take on Mr. Khan’s use of the lights: “He decided to go loco with Christmas lights, Red-hot chilli pepper lights & all the paper decorations and this worked because it was original, NO ONE in Little Bengal had such an ambiance.